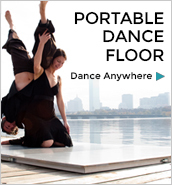 Dance Anywhere — Rent the Floor! Designed for dancer comfort and safety, the Boston Dance Alliance portable sprung wood floor makes it possible to dance anywhere, indoors or out. Its light, portable panels can be installed in a number of different configurations (square, rectangle, L-shape) in 30 minutes. Sizes range from 5’x 5′ to 35′ x 37’6″. Special sizes may be available by prior arrangement. View full specs. The BDA floor is suitable for dancing barefoot or in shoes of any kind (pointe shoes require additional Marley rental). We rent anywhere in New England! BDA’s floor can be picked up and assembled by nonprofessionals without special tools. Want a turnkey solution? BDA partners with floor technicians who can pick up, deliver, assemble, and remove the floor based on an hourly rate. Contact us for details. Watch and see how easy it is to assemble the BDA floor!